Stovetop Tandoori Roti : is your answer to the much craved ‘Tandoori Roti’ which is usually prepared in oven/tandoor. You just need to ferment the dough for this particular roti for 24hours and then it’s as easy as making any Indian Roti or Flatbread. Serving Suggestion: Serve Fresh with Brown Butter(Ghee) or Butter smeared along with choice of curry or vegetable. Note: This version needs 24hrs/1day to keep the dough for fermentation. In a food processor, add all the mentioned ingredients except “oil” and pulse to make a firm dough. Now work the dough with hands for 3-5 min on a hard surface, dab oil all over and keep in an airtight box with lid on in the fridge for 24hrs. After 24 hours, take the dough out from the fridge and keep aside for getting it back to room temperature. Make 10 equal size balls, roll them with a rolling pin into a medium size roti/disc shape. Heat the non-stick pan on high for 3-4 min and reduce the heat to medium. 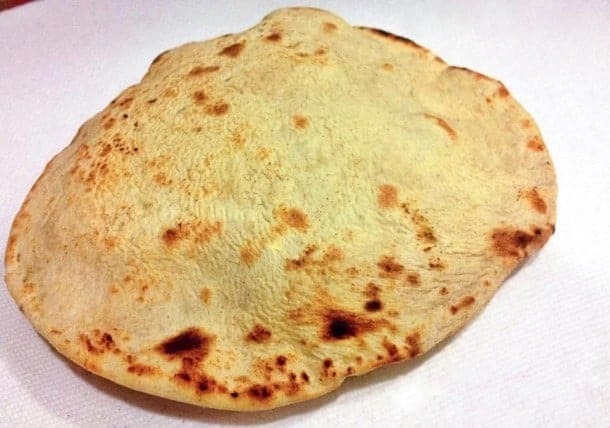 Take one roti/bread, pat it with little water on both sides and put roti on a pan, when you see bubbles on the side up, turn it to the other side. Now using a kitchen cloth, press the roti lightly to cook the side down keeping an eye that it doesn’t burn the roti on the side down. Continue this process until the roti/bread is cooked on both sides. Follow the steps above to cook all the roti/flatbread. Make 10 equal size balls, roll them with rolling pin into a medium size roti/disc shape. Take one roti/bread, pat it with little water on both sides and put roti on pan, when you see bubbles on the side up, turn it to the other side. Now using a kitchen cloth, press the roti lightly to cook the side down keeping an eye that it doesn't burn the roti on side down. Continue this process till the roti/bread is cooked on both side. 1 Reply to "Stovetop Tandoori Roti"